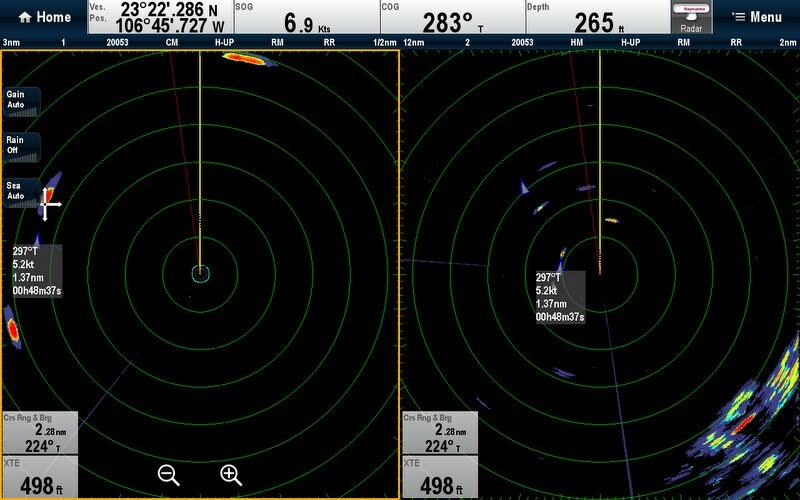 In February of this year (2013) I replaced my Raymarine radar and plotter. The older 24 mile unit had failed and new radar units from Raymarine were not compatible with my RL80C plotter. I replaced the RL80C with the Raymarine E125 unit and the radar with the HD Color 24 inch closed array unit. Now that we have had a few months to play with it and do several overnight passages with the radar I thought I'd share pluses and minuses of the installation and usability of the set up. Cables for radar is smaller than the old one. This made it easier to fish it into the mast. The E125 unit has two NMEA 183 ports that I needed to communicate to my existing instruments. Bolt pattern for the radar was identical to the old one. This made the physical mounting easy. The E125 has no Seatalk connectivity to be compatible with my existing instruments. 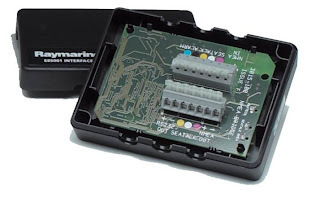 I was lucky that I already had a Seatalk to NMEA 183 bridge that allowed me to interface to my installed instruments. Seatalk to NMEA converter. This converter also has an RS-232 interface that connects to my computer. I use this connection on the laptop for Airmail (ham radio email) - lat/lon, sog, cog. Configuration of data screens. Lots of options to view data any way you want. WiFi with Ipad. Ipad works as a remote display down below. Screen quality and brightness is amazing. Charts. 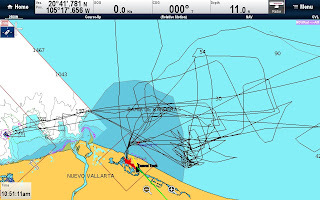 I bought the Navionics chart chip that covers Mexico. It is way more accurate than the c-map charts in the RL80C. I have no more screenshots of the boat on land! AIS integration. I feed AIS data to the plotter from my Standard Horizon GX2150 VHF radio. 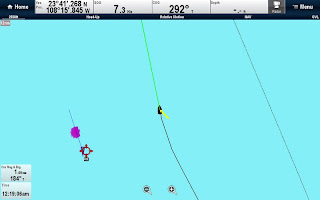 We have been getting AIS data on the radio interface and on the laptop using Paul Elliot's free program NavmonPC. The integration with the plotter is great in both the radar mode and chart mode. BTW, I have a lot of great things to say about NavmonPC in a later post. We have experienced several hangs and reboots(5 or 6). The firmware for this new product has some bugs. The good news is that the procedure to upgrade firmware is easy. I've done it once and the new version added new features and fixed bugs in the first release. Dual range radar. 3 miles on the left and 12 miles on the right. Gain controls are no better than my old unit. Mid and long range no better than my old unit. Finding pangas at more than 1 mile range is not possible. I had hoped that the radar would perform better for small, fiberglass targets. The good news is that the radar supports dual range so I'm not moving the range up and down all the time. At a high level the plotter exceeded expectations and the radar is just OK. In the Whiskey Tango Foxtrot category. 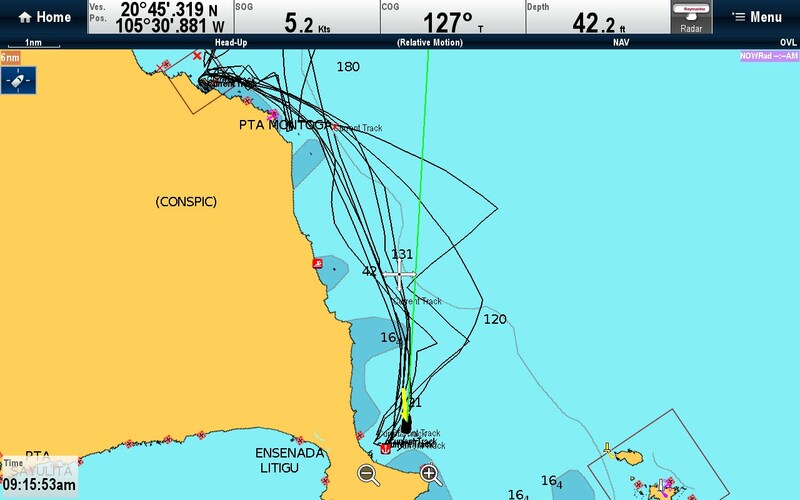 Here is a screenshot of a ship passing on our port side at 1.6 miles during the Mazatlan to Baja passage. 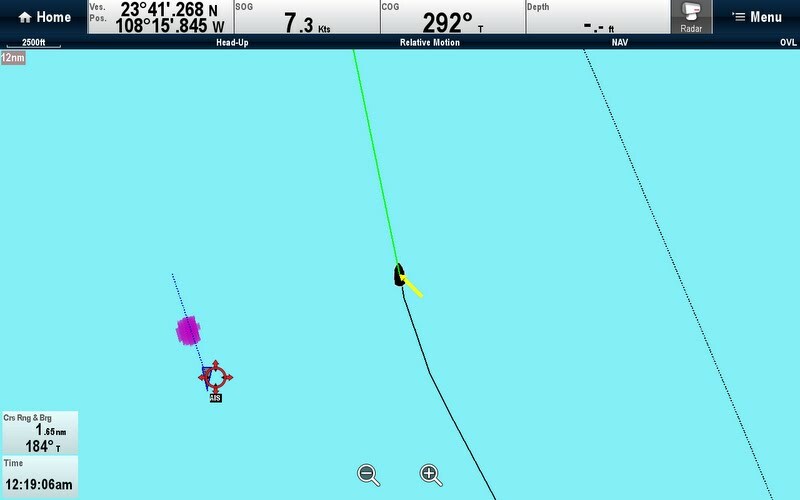 Note the AIS arrow is pointed the wrong way. The ship must have a problem with the heading data they are sending out. The SOG was correct but the Heading was 180 degrees off. To us it looked like the ship was passing us in reverse! We had a good passage from Mazatlan over to the Sea of Cortez. About 38 hours in all, got to sail about 5 hours of that. It was nice to only have one overnight. We made landfall at Muertos, just South of La Paz. Flying the spinnaker on the crossing. Non-sailing friends sometimes wonder about our watch schedules. I had recently asked some friends on what they do, as a couple, with overnights, as many were making the same passage. I decided to stay up as late as I could (1AM) and let Rob sleep. Then he got up at 1230AM anyway, helped me out with a neighboring ferry boat or tanker that was coming a little closer, and I went to bed. I was up before 5AM and continued to be on watch until later in the morning. We felt pretty good when we arrived in Muertos Bay, around 2-3PM. We chatted with some neighboring sailors, and then decided to stay an extra day to enjoy the beautiful beach, and see who else would show up. The sailboats that arrived included a big group of affectionately called “kid boats”, Northern Passage, Star Passage, Sweet Dreams, Resilience. We spent the next full day on the beach, arriving by Stand up paddle boards, with beach toys, sunscreen and little money. It was refreshing having some hang-out time with the ladies, flying kites, watching the young boys skim board in the waves and girls prance on the beach. The day ended with a great exploration to the Gran Sueno resort, where we were greeted from the grand staircase with a “Welcome Home”. Sandy sailors, pool tables, a massive model train collection filling the upper lodge, quiet fountains, good food and beautiful views. The next morning we were up early, determined to sail out around the point, and up the Cerralvo Channel, which can get very windy. The route took us past remote beaches with little developments. 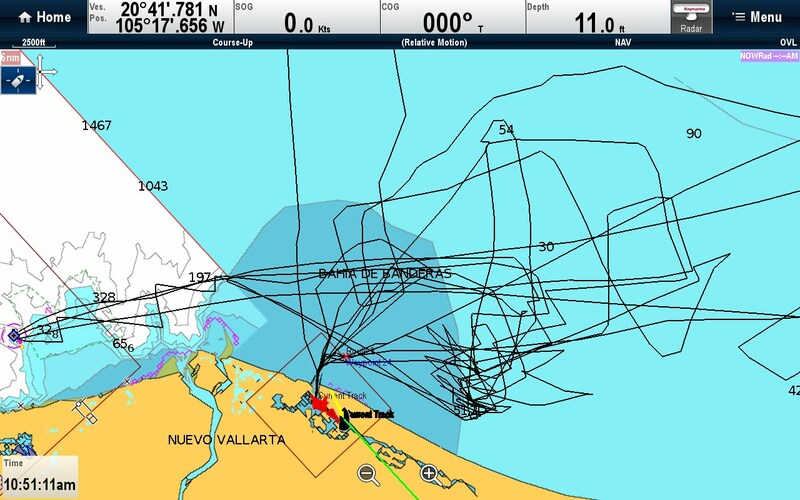 We noted the location of Las Ventanas and Los Brailles, which are supposed to be meccas for windsurfing and kitesurfing. The season starts there in November, so it is penciled in on our calendar for next fall. Next stop was straight into Bonanza Bay, a huge horseshoe white beach where two other sailboats were quietly anchored. We had a beautiful afternoon of exploring the long, shell strewn beach, accessed via our boards. The sand was made up of little shells, each one was tumbled smooth from the waves. We could see and hear on the radio other sailboats as they also made it up the channel and turned west and then south towards La Paz. Our first plan was to go directly into the islands north of Laz to wait out the approaching Northerly winds, but we decided to head into the town of La Paz. As Nancy described, “there is a galley emergency, we are down to the last tomato and onion”! Rob happily obliged as he has heard many tales of the local watering hole named “The Shack”, which supposedly serves up vertically challenged hamburgers to enthusiastic patrons. While I am happy when Rob and I have seafood every day, there are times when we'd really like to have some good meat.. The quality of the meat available to us in the neighborhood tiendas, carnecerias and other larger stores varies widely. We've mostly stuck with pechugo de pollo (chicken breasts), some lunch meats, an occasional pork chop and a little ground meat. We were excited to hear of Henderson's Prime-Meat-Packers near the Mazatlan Marina through our friends on S/V Krissy. Without hesitation, I walked in yesterday morning at 9am, and filled a large cooler bag with frozen rib eyes, pork chops, chicken breasts, wings, and ground beef, all individually wrapped and labeled. Power walked it back to the sailboat in 10 minutes, and loaded up our newly charged freezer. We are now ready for our next sailing voyage, from Mazatlan to the Sea of Cortez. Departure time is 7am tomorrow; we expect light winds, and a distance of about 190 miles. We hope to arrive by Sunday night, before sunset. Here's a photo of the pile of meat, with our friend, aptly named "Mr. Piggy", watching over it all. Mr Piggy is also a good watch companion on overnight passages; he times each 60 minutes and his hourly ringing is something that a tired sailor looks forward to. Many of our friends are on their way to the South Pacific. Most left the Banderas Bay area about 2 weeks ago and are half way on the 2700 mile trip. In the evenings we listen in on the single sideband radio net and hear about the passage. When communications are good we've talked to several boats. Here is a audio clip of our buddies on Wizard checking into the net with their position and speed. There are about 30 boats that check in and report position, speed and weather. This year it seems that there is a little less wind than normal and boats are taking a bit longer to make the crossing. This morning we are heading out of the bay and making our way North. We stuck around Punta de Mita to enjoy a new swell that came in over that last few days. Here is a video of Rigo (s/v Heavy Metal) and I goofing off in the waves. We should be in Isla Isabela tonight and then on to Mazatlan after that. The spot tracker will be on! It is hard to believe that we sailed under the Golden Gate 200 days ago. It seems like yesterday. The cruising community mantra is that "Plans are made in the sand.... - at low tide." Rob refers to Plans being "flexible". I guess it's time for a new Plan. Before we left the Bay Area we thought we might join the spring Puddle Jump to the South Pacific. The Puddle Jump is a loosely formed rally that departs from several places on the west coast of North and Central America around the March/April time. There have been a series of seminars and gatherings in La Cruz and Paradise Village to support all the boats heading West. 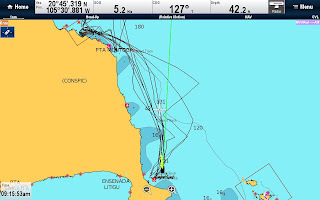 Many of our sailing friends are now on their way, heading towards the South Pacific. Many months ago Nancy and I decided not to do the Puddle Jump this year. Why rush out of Mexico? We are having such a great time here and we haven't even starting to explore the Sea of Cortez. Explore more of the Sea of Cortez before crossing to the mainland Mexico. After some friends commented that our original photo "doesn't look anything like you", we've updated to this photo, taken while sailing Shindig on Banderas Bay.